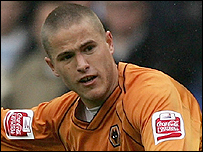 Wolves winger Michael Kightly enjoyed the reception he received on his return to former club Grays Athletic. The 21-year-old left the Conference club for Wolves in January 2007 and the two sides played out a goalless draw in Saturday's pre-season friendly. "I had a good reception which was pleasing. I had a good time here and it was nice to come back and say a proper goodbye to people," said Kightly. "It was the first part of the warm-up towards getting ready for 11 August."